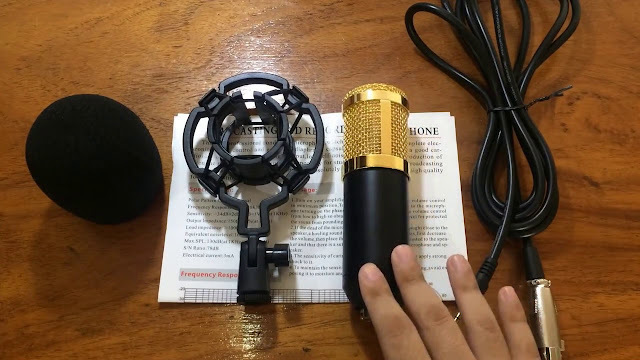 Why should you consider using BM-800 Condenser Microphone when doing video blogging and even live streaming? During my early days of vlogging and live streaming, I am not really very particular with tools and gadgets as long as I do what is expected of me but then there are things that you need to do. Things that can improve the quality of your output. Have you noticed what is commonly present in the usual microphone/mic of your smartphone or mobile phone? These mics usually pick up all the sound from all sources, and that includes your voice and the random noise everywhere else. If you are doing a vlog or at least a video which you want to share to Instagram or for your clients, including background noise is somewhat a turn-off. I noticed this problem when I did an interview for GrandChase PH and the background sound was so loud but I have no choice but to include that video. The best quality video is where the captured sound is filtered and the viewer only hears what they should hear. This also goes to live streaming like Twitch. Everyone wants to hear you speak unless the sound of a honk or your mother yelling at you is an added value. There is a big difference when you use BM-800 Condenser Microphone. You can use this as your regular mic for singing or in your live streaming for Twitch, Facebook or YouTube. Best of all, you can also use this for your mobile phone. Watch the video below to know more about BM800 Microphone for Mobile Phones and Live Streaming. If you are already using BM-800 Condenser Microphone then share with us your experience, we would love to hear about it. I hope this article and the video helps you.